Giuseppe Giusti Francesco Maria Family Reserve Balsamic Vinegar...the long slow process taken to produce Giusti Francesco Maria Balsamic exhibits the art & quality of the four balsamic vinegars bearing the name of a family member. Giusti Francesco Maria Balsamic exhibits the carefully selected battery of different wood barrels used for the Family Reserve collection. Each Family Reserve collection is comprised of its own set of wood barrels, dating back centuries, each exhibiting their own flavor & aroma. Francesco Maria Balsamic is labeled with an I.G.P Logo (Protected Geographical Location) meaning the production of Francisco Maria balsamic has to follow certain production criteria in order to qualify for European Certification. The Giusti family is Modena's oldest producer of balsamic vinegar, dating back to 1598, & officially founded in 1605, owning Modena's largest collection of very rare barrels dating back to the 1600's. Giusti Francesco Maria has deep, rich, & complex flavor characteristics, with just the right amount of sweetness. Giusti Francesco Maria Balsamic is great drizzled over fresh fruit, aged cheeses, fresh seafood, & meats. For salads, add your seasonings, drizzle Francesco Maria Baslamic, lightly toss & then add your favorite olive oil...Enjoy!!! 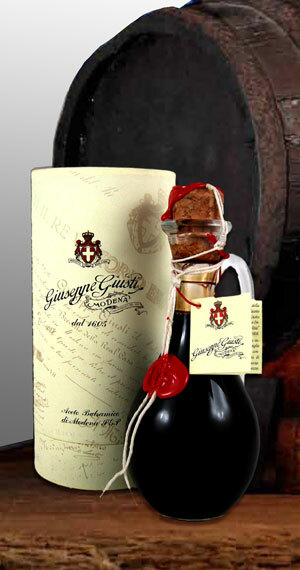 Giuseppe Giusti Family Reserve Balsamic Vinegar. Giusti Francesca Maria I.G.P. / Family Reserve Balsamic Vinegar.